Description: In Revelation 21-22 in Light of Jewish and Greco-Roman Utopianism, Eric J. Gilchrest offers a creative and compelling reading of Revelation 21-22 as understood through the lens of ancient utopianism. The work is in two parts beginning with a detailed portrait of ancient utopianism based on Greco-Roman and Jewish traditions. The portrait sketches the �topography� of the utopian landscape, which includes a thorough account of various traditions using fourteen utopian topoi or motifs. The author then moves to a description of Revelation�s new Jerusalem in light of these two utopian traditions. With sensitivity to how this text would have been read by each utopian perspective, the author constructs a unique reading of a classic passage that highlights the variety of ways the text originally may have been heard. 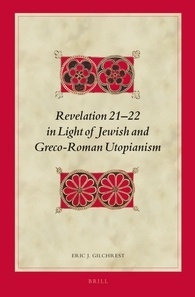 Citation: Thomas Hieke, review of Eric J. Gilchrest, Revelation 21-22 in Light of Jewish and Greco-Roman Utopianism, Review of Biblical Literature [http://www.bookreviews.org] (2014).